People wore waterproof salmon-skin mittens to keep their hands dry while kayaking, driving a dog sled, or working with fish nets. Woven grass liners went inside for warmth. To prepare the fish skins, they were first soaked in urine, scraped clean, and then hung outside to freeze-dry in cold weather. The last step was to scrape off the scales. Neva Rivers: Arilluk. Maa-i makut qanaatellrenka arilluut. Neva Rivers: Wangkuta piliaqamta unani teggevniarulluki nayiit tukulgitneng amiinricuitaput nayiit tukulgit makuciqnaluki. Allunga, allnga. Joan Hamilton: In the Hooper Bay area, they used sealskin right here [palm area]. Joan Hamilton: Seal flippers, so they wouldn’t tear as easily. Neva Rivers: Won’t wear out that fast. Joan Hamilton: They used heavier fish that has thicker skin. Taryaqvauguq-qaa tamana, wallu-q [is this king salmon]? John Phillip, Sr.: Makut-wa taryaqvalinraumillilriit. Mana tam’ taryaqvaunri, qaa? Neva Rivers: Qavlunaneng wangkuta pitukut. Pilugugkiuraqameng taugaam, qemagvigkiuraqameng-llu taryaqvaaneng pituut. John Phillip, Sr.: Mecungnanu-w’ tua atutukait makut wani. Wiinga qayalallemni wan’ tua-i uitaur, ready all the time for when it gets wet, stormy. Joan Hamilton: Augkut-llu nunam ukut ayuqenrilngut qanellruut tavani-gguq uitaravkarluki. John Phillip, Sr.: Ii-i, uitauralartut egmian teguqayunaqluteng. Joan Hamilton: Qayarrlainarmi-qaa makut aturlallruit? John Phillip, Sr.: No. Ayaulluki yuilqumi waten tumyaararkaugaqameng waten imkunek taluyartaqameng-ll’ imumi atul—malikluki pilallruit. Mecungnaunani. Joan Hamilton: Like situations where they’ll get wet, hands. Like working with dip nets. John Phillip, Sr.: Tua-i-llu wani imarpigmi anuqliuquni, nutaan tau-i allukek qaspeg egenrarlukek ukuk wani cagnilluku nutaan mer’ iterngaunani. Joan Hamilton: These are really much warmer than any of the artificial material you use for protecting yourself from rain, from the elements. That gets cold. But if you wear these, you stay nice and warm. If it’s raining, bad weather or high seas, then you put this on and tighten them, and then you tighten your raincoat all around. And then you effectively become waterproof. So if you turn over, you can right yourself without getting wet or sinking. John Phillip, Sr.: Grass-aneng iluit pingqerturatullrulruut waten. Neva Rivers: Evegneng-ll’ iluiteng tegullerkamegteggun qamaggun man’a evegneng pingqetullruuq. Joan Hamilton: And also, sometimes they put grass right here [palm area], so you can have some protection between what you’re handling and you. Aron Crowell: Are those sewn with sinew thread? John Phillip, Sr.: Yualunek-wa pilaqait tamakut. Tua-i ava-i kiingita yualukangqellruut. Neva Rivers: Ivalungqerngatut taperrnaneng ayuurucirciqut tua. John Phillip, Sr.: Umcigluki cakneq. Mer’ iterngairulluku. Joan Hamilton: Ilumun [that is true]. They would not consider using rye-beach grass as thread, especially for these, because of the properties of grass. It’ll break. Neva Rivers: Ivalurrlainarneng makut atutuut. Ivaluugut makut kelii. Taperrnaneng taugaam ayuurucirluteng. Joan Hamilton: And then they used the rye beach grass to make them waterproof. Aron Crowell: Inside, like we talked about before? Joan Hamilton: You can see it. Sinew and then anchored with that grass, to keep it waterproof Otherwise if you just use plain sinew, it might go through. Neva Rivers: Waterproof-aneng pilaqameng ukatmun waten kelirturatuut. Natrirluteng tam-ll’ ayuurucirturluki taperrnanek. Joan Hamilton: When they’re sewing for any waterproofing purposes, they sew them the way she was demonstrating. 1. 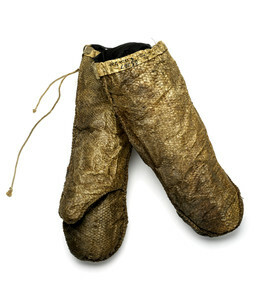 Arilluk [waterproof fish skin mittens] is the dual form that refers to a pair, and arilluut is the plural form that refers to three or more. 2. Yualuq is “sinew” or “thread,” and yualukaq is sewing thread made of caribou, whale or moose sinew (Jacobson 1984). Woven grass liners went inside the mittens, for warmth and comfort. (4) Salmon skin, which is durable, light, and water resistant, was also used for boots, bags, and parkas.